DISCLAIMER: The author is not a certified BJCP judge; therefore, this score sheet is not necessarily indicative of proper BJCP judging techniques and protocol. The author is grading to 2015 BJCP Guidelines in order to prepare for examination. 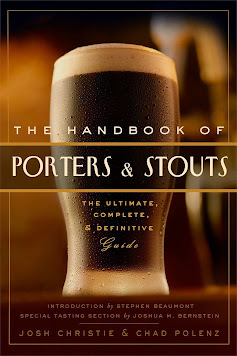 "The Handbook of Porters & Stouts"
The best of the best. Hall of fame beers. Great in virtually every aspect. Almost as good as a 10, but missing something that would make it a top notch beer. A tasty, satisfying, enjoyable beer. Little to no flaws, plenty of attributes, and fun to drink. Just plain good. Nothing about it blows my mind, but it's definitely satisfying. The lowest I can rate a beer and still honestly give it a thumbs up. The attributes are enough to overshadow the flaws. Nothing I'd jump for joy about, but a drinkable, satisfactory beer to be sure. Not quite a good beer, not quite a bad beer. I don't have a strong opinion either way about it. There may be something to like here, but there's also something holding it back. The best of the worst. A beer with noticeable flaws and perhaps some minor attributes. Tolerable for a serving, but no reason to seek it out. A genuine thumbs down, but not something I despise. While not the worst beer, there's probably nothing about it that I like. Plenty of off-putting features. I can tolerate a single serving, but would recommend avoiding it. Very repulsive, unappealing beer. Nothing to like about it. Barely drinkable. Everything that could be bad about it is. Unlikely to even be tolerable for more than a few swigs, if at all. The absolute worst of the worst. Aggressively repulsive in every way. Cannot even stomach a single swig. All material is wholly owned and created by Chad Polenz. All rights reserved.. Awesome Inc. theme. Powered by Blogger.